In today...s fast and competitive world, a program...s performance is just as important to customers as the features it provides. 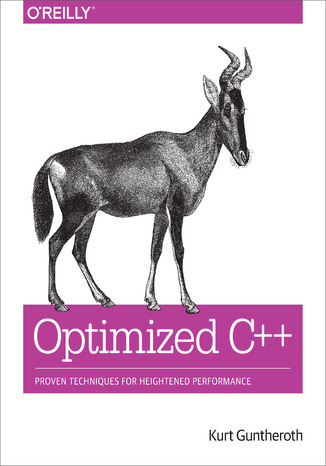 This practical guide teaches developers performance-tuning principles that enable optimization in C++. You...ll learn how to make code that already embodies best practices of C++ design run faster and consume fewer resources on any computer-whether it...s a wa tch, phone, workstation, supercomputer, or globe-spanning network of servers.Author Kurt Guntheroth provides several running examples that demonstrate how to apply these principles incrementally to improve existing code so it meets customer requirements for responsiveness and throughput. The advice in this book will prove itself the first time you hear a colleague exclaim, “Wow, that was fast. Who fixed something? "Locate performance hot spots using the profiler and software timersLearn to perform repeatable experiments to measure performance of code changesOptimize use of dynamically allocated variablesImprove performance of hot loops and functionsSpeed up string handling functionsRecognize efficient algorithms and optimization patternsLearn the strengths-and weaknesses-of C++ container classesView searching and sorting through an optimizer...s eyeMake efficient use of C++ streaming I/O functionsUse C++ thread-based concurrency features effectively Ebook porusza temat Optimized. Jedną z istotnych spraw poruszanych w ebooki jest: Proven. Jeśli interesuje Cię: Techniques, to ebook dla Ciebie. Dużo wiedzy na temat: Heightened w formacie EPUB, MOBI i PDF. Hasło przewodnie tego ebooka to Performance. ISBN 978-1-4919-2201-9. Porównywarka cen ebooków, które dostępne są w formatach PDF, MOBI i innych. Na urządzenia Kindle i inne. Tutaj znajdziesz ebook, którego szukasz. Nie wszystkie ebooki w ofercie są darmowe. Wspierajmy autorów i kupujmy ebooki.